Major changes in the watershed are expected to occur in the next 20 or more years as the area approaches planned build-out with related increases in land use intensity and population density. Local issues include added infrastructure demands, wildfire/landslide hazards in the upper watershed open space areas and wildland/urban interface that affect sediment processes, changing dynamics for flood management due to climate change and an increase in impervious surfaces, and increasingly challenging regulatory requirements for water quality. Regional issues include uncertainty over the availability of imported water due to drought and environmental issues in the Sacramento Delta. (The allocation of water from the Sacramento Delta was recently reduced by 33% as a result of a single court ruling.) Global issues include expected climate changes resulting in a drier, warmer California with varying hydrologic patterns, a rising sea level that will impact low-lying coastal areas, and the need to reduce greenhouse gas emissions. The worst visible threat to the Bay is the trash that is carried here through the storm drain system during winter rain storms. 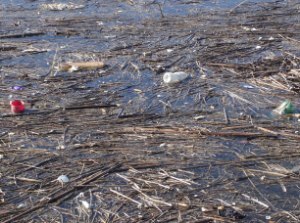 Not only is the trash unsightly, it is also dangerous to the marine life and the birds that get tangled up in plastic or eat polystyrene mistaking it for food. Each September an Estuary Cleanup Day is held and, in a few hours, more than 10 tons of trash is collected from the Bay by teams of dedicated volunteers. We participate in various outreach and other efforts to reduce the amount of trash created and/or improperly disposed. A second threat is the dumping of motor oil, gasoline, paints and other hazardous liquids and the run-off of pesticides and fertilizers. Any oil that is poured into a storm drain in our watershed will end up in the Bay. The problem caused by run-off of fertilizers from nurseries and landscaped areas is not immediately apparent but very significant. What happens is that an excess of nutrients in the water causes an algae bloom – the overgrowth of algae on the surface of the water. The decomposition of algae after it dies off uses up the oxygen in the water affecting the fish population. In extreme cases fish may die in large numbers because of a lack of oxygen. A third threat is the build up of silt washed down into the Bay. In the past, soil eroded from the hillsides around the Bay ‘s watershed would settle out on the plains below. With increased urbanization concrete channels have been built to direct the storm water, and with it the silt, to the Bay. At the same time land development in the watershed has resulted in soil erosion at the construction sites that has added to the silt deposited in the Bay. Without remedial action the Bay would soon become a meadow. Nearly a million cubic yards of sediments were removed from the north east corner of the Bay in 1998/9. Nearly million cubic yards of sediments were removed during the Army Corps of Engineers UNB Ecosystem Restoration Project completed in late 2010. These threats are addressed through the compliance programs stemming from the federal Clean Water Act, including municipal National Pollutant Discharge Elimination System permits countywide and Total Maximum Daily Load regulations for individual pollutants in specific watersheds within the county.